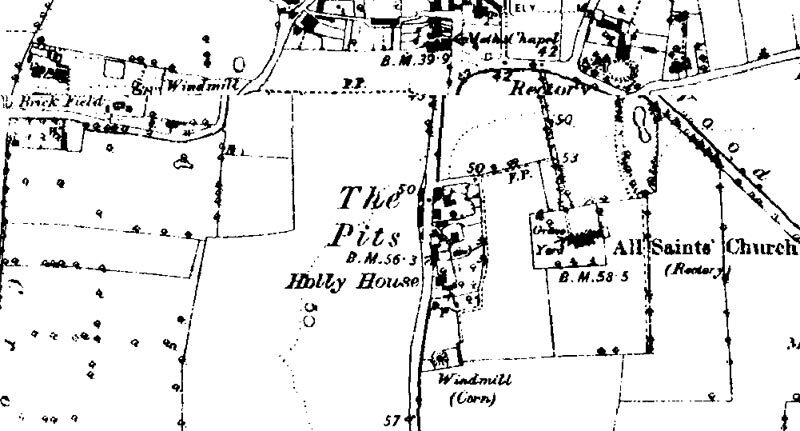 Hilgay postmill stood just to the east side of West End and was probably operating on its site for at least 250 years. Thanks his friends for their patronage during the last 30 years & solicits a continuance of their commands in the above branches of business. Steam & Horse machines of all kinds carefully attended to. Agricultural Implements of the most approved principles built or repaired. Joiners & Smiths work of every description. Timbers sawn by steam power. WANTED immediately, a steady man as JOURNEYMAN WHEELWRIGHT & CARPENTER, constant work for a good hand. Apply to John Whittome, Millwright etc., Hilgay, Downham Market. An Iron Wind Shaft suitable for a post or tower mill. Apply to J. Whittome, Millwright, Hilgay, Downham Market. The postmill stood to the south of the footpath, site now two cottages. Family house was built by John Whittombe in Holt's Lane with a steam mill and foundry nearby. Windmill belonged to George Whittome (grandfather) and his cousin Richard Whittombe. It has not been possible to accurately place all individual millers with a respective mill in Hilgay. The Whittome family also ran Hilgay Ely Road smockmill for several generations.